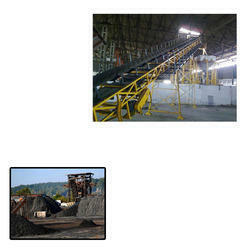 Our range of products include belt conveyor for coal handling. Leveraging on our years of domain experience, we are indulged into manufacturing, exporting & supplying wide array of Belt Conveyor for Coal Handling in different sizes & designs. Belt conveyor consists and is coupled with a pulling car and can displace along the field. It helps stack management conveying the bags or boxes to the vehicle from the storage. It has been employed for variety of uses. It has an extendable arm to reach the full length of the vehicle or container. Its mobility is such that, it can be shifted anywhere with minimum effort man power. Moreover, It has become must equipment for dispatch department and has been available in many options & length to suit the container or truck length.